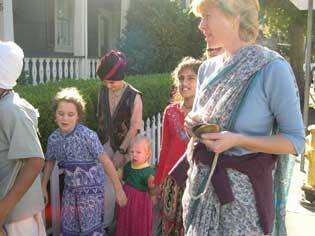 Madhumati Didi, Braja Mohini Didi, Revati Didi, Sita Didi and several other ladies gathered their children for a special way to celebrate Halloween. They would lead their own harinam party! 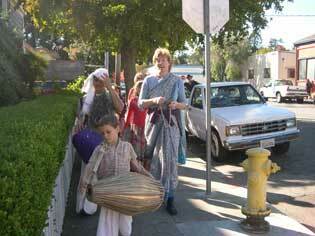 Braja Mohini Didi helped give the children some confidence by starting the kirtan. Hare Krishna Hare Krishna Krishna Krishna Hare Hare! Everybody sang along. 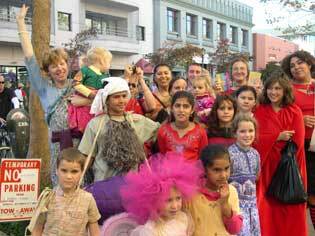 Syama Das and Premananda Das played mrdangas and led the group through the crowds of trick-or-treaters on Pacific Avenue. 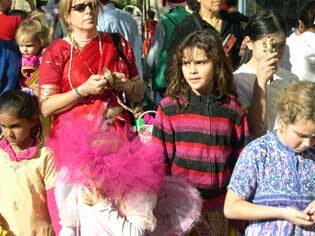 The children were all dressed in their devotee outfits. 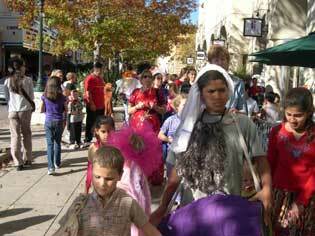 Some wore fake beards and others wore featherd masks in the costume spirit of Halloween. As we walked through the streets, I heard several comments: "Look they are having a parade!" Others wondered what language we were singing in. The kids that were watching stopped what they were doing and stared at us in awe. Some danced and almost everyone took pictures. 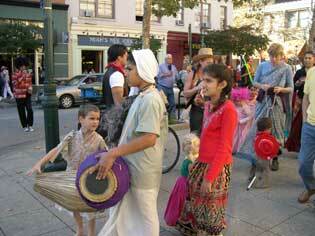 At one point someone yelled: "Look they are dressed up as Hare Krishnas!" I could not stop lauging after that. 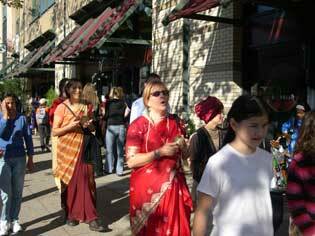 The sweet little devotees chanted for about 30 minutes and then we made our way back back to the preaching center on Union Street. The kids were very happy and excited to be together. They were all distributing the Holy Names of the Lord. Harinam Sankirtan ki jaya! 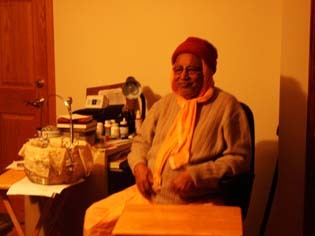 Later that night, before the kids went trick-or-treating, Srila Govinda Maharaj passed out candy. Even the adults went to His lotus feet, saying "Trick or treat Gurudev!" He smiled and gave us Laffy Taffy, Crunch Bars, and Kit Kat bars.